Turkey, just like other countries, has its own delights, especially in regions like Antalya that is the second most visited tourist destination in the country, after Istanbul. Stretching along a massive coastline, the region comprises of many smaller holiday resorts as well as the city centre, so there are plenty of things to do in Antalya. My first visit was in 2004, but it was mainly for my job as a holiday rep, and I returned in 2010 for a months-long trip of the coastline starting from Kemer and ending in Fethiye. That being said, I still have so much more to see and do so a return visit is needed. 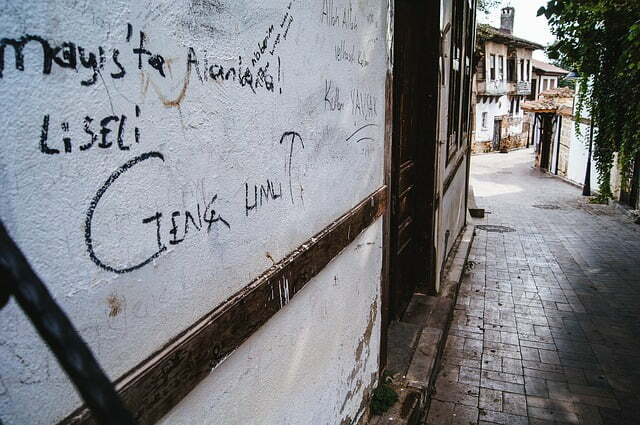 With that in mind, I’m sharing my own travel planning list of things to do in Antalya. For the benefit of the reader, if I’ve already done the suggestion, then I’ve also given a link to the full article on this blog. Alternatively, where possible, official websites are included, and they provide more information, opening times, and locations. So let’s get started. While Antalya city centre is a modern hub of fashionable trends, the old part is an attractive place to spend a relaxing day. Including the historical entrance of Hadrian’s Gate, the old walled quarter called Kaleici in Turkish also houses restaurants and bars for seaside, alfresco dining, souvenir shops in among old Ottoman-style houses and the Kaleici Museum with its mannequins depicting life in the area in eras gone by. Also, see YivliMinare Mosque dating from the 13th century that is an excellent example of Seljuk architecture. Roughly 12 kilometres northeast of Antalya lies the precious Düden Waterfalls. The greenery offers plenty of shade, which makes this a sublime location to visit on a hot day. The cool, moist air provides a real sense of refreshment. Unfortunately, you’ll have to pay a small entry fee, but this is a minor price to pay for such a pleasant way of passing the time. Further afield, another favorite nature spot is Manavagat waterfalls. I last visited in 2004 but reading reviews online, gives me the impression that it is just as popular now as it was then and features on most daily tour itineraries. 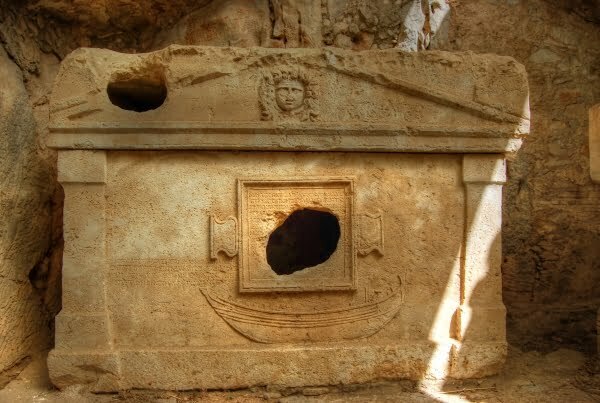 The Antalya Museum is closed on Mondays, but opens on other days, and the impressive Hall of Gods is the home of 16 ancient Roman gods and goddesses while another room displays sarcophagi recovered from the burial grounds of Perge. The museum itself is based roughly two kilometres west of the district of Kaleiçi and is known as one of the best in the country. Antalya’s famous Lara Beach is setting of one of the world’s biggest sand sculpture festivals, Sandland. Using just sand and water, participants create massive sand sculptures based on a particular theme, and these remain on the beach throughout the summer. Past topics have included mythology and specific countries. 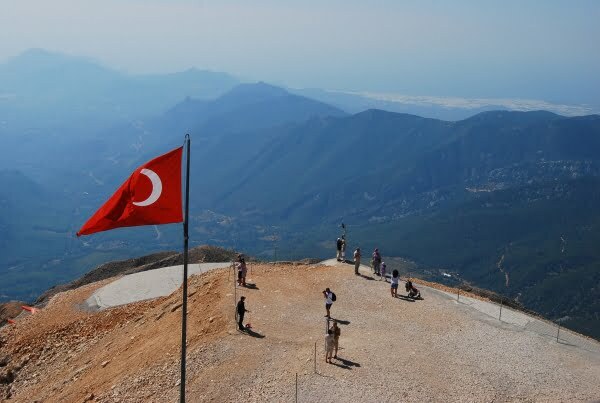 This domineering mountain looking out over the coastline of Antalya offers what they call the “sea to sky” package. A short cable car ride takes you to the 2365 metres high station that includes a restaurant, cafeteria, and photo opportunities. On one side is the backdrop of the majestic Taurus Mountains, which are magnificent in their own right, or you can view the coastline that is clear on a sunny day. Adrenaline junkies can also opt to paraglide down instead of taking the return cable car journey. One of the aspects that I love most about the Antalya region is that it has a main coastal road called the D400 that gives easy access to all resorts. Adventurous travellers would do well to hire a car for 4 days and explore smaller coastal resorts starting from the cosmopolitan hub of Alanya and finishing in the traditional but modern town of Kas. I personally didn’t like Kemer and would miss it out. Likewise, Belek is more for the golf lovers, but places like Side with the temple of Apollo, or Cirali with its village vibes and atmosphere are a delight to visit. These are still on my bucket list to visit, but no article about things to do in Antalya would be complete without them. Aspendos holds the reputation of being home to one of the finest antique Roman theatres in the world and even these days, it is still used for concerts because of the beautiful acoustics. 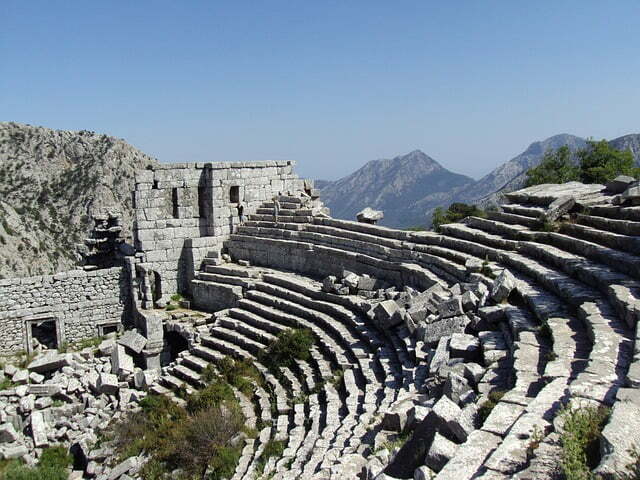 While Termessos in the Gulluk national park, northeast of Antalya central, has a hilltop location and an agora, water cisterns and ancient theatre to see. I’m not a beach lover so haven’t explored this area but it is a favourite recommendation for many travel guides and repeat visitors to Antalya. It is one of two main beaches of which the other is Lara that tends to be dominated by the all-inclusive hotels. Stretching for 7 kilometers, there are many bars, restaurants, and shops surrounding it, therefore making it an excellent area for families. Also sitting nearby is Antalya Mini City that has miniature replica models of some of Turkey’s most famous landmarks. A relatively new introduction to the Antalya region, this new attraction has so far won rave reviews from visitors to what is one of the biggest aquarium complexes in the world. Read all about it on their official website here. Cirali and Olympos are two resorts on the outskirts of Antalya that share a long pebbly beach, also used by Loggerheads turtles to lay their eggs. 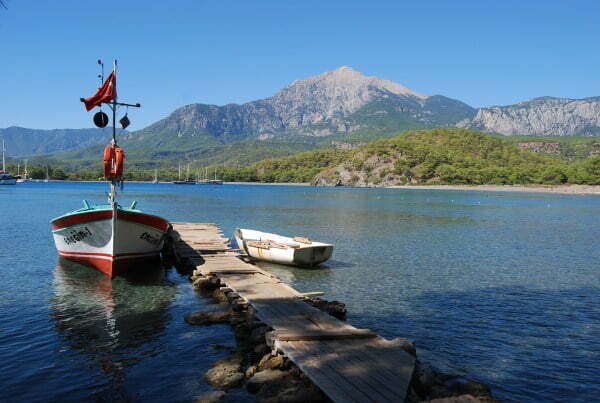 Budget travellers and youngsters tend to choose Olympos for accommodation while others gravitate to Cirali. Both resorts make an ideal overnight trip since as well as the beach; there are historical ruins of Olympos nestled in the forest area and the burning flames of Chimaera to explore. You can also visit on a day trip if you are passing through the area but the 24-hour burning flames are more prominent at night. These ruins nestled in a half bay and surrounded by one pebbly beach and one sandy beach are cute, quaint and one of my favourite things to do in Antalya, even if it is away from the city centre. It is an old city seaport dating from the 7th century BC and as well as the remains of the agora street, shops, and aqueduct, a small theatre surrounded by shrubbery sits back off the main drag. Phaselis is perfect for families since it combines fun history exploration with swimming and beach time. The last recommendation of things to do in Antalya, actually starts in that region but ends in Fethiye, further along, the coastline. The Lycian Way is one of the world’s best long walks and is 320 miles long. If you have the stamina to cover the whole 320 miles, the walk will take you through delectable coastal scenery, and this includes places that you can’t get to by car. It’s best to avoid doing the walk in summer since the heat is ferocious. However, if you’re feeling more energetic, you can even cycle the route as it has now been graded medium to hard. It gets easier towards Fethiye! My method for travelling the Lycian way doesn’t count because I used the bus system to get from resort to resort, but it is another option if, like me, you are not a trekking fan but still want to see the historical sites of Antalya and the South-West coastline.